On Thursday, the World Series of Poker revealed two new inductees to its prestigious Poker Hall of Fame. 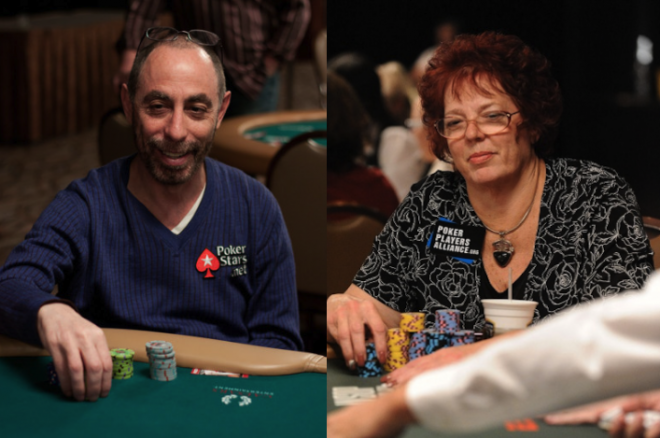 Barry Greenstein and Linda Johnson were voted in by a 35-person panel of existing Hall of Famers and media members, becoming the 41st and 42nd members of the elite group of poker icons. They will be officially inducted on Tuesday, Nov. 8, at the Rio All-Suite Hotel & Casino as part of the November Nine festivities. Greenstein is recognized in the industry for his accomplishments on and away from the felt. The "Robin Hood of Poker" has accrued more than $7.5 million in live tournament earnings while amassing three World Series of Poker bracelets and two World Poker Tour titles. He is also regarded as one of the toughest cash-game players of all time while playing in some of the biggest games around the world. Away from the table, Greenstein is just as admired for his charitable contributions. He has donated more than $3 million to various charities through his poker winnings, which helped earn him the nickname "Robin Hood of Poker." Greenstein is also an accomplished author and father of six, including four stepchildren. "I'm happy to be inducted into the Hall of Fame alongside my friend Linda Johnson who has been the most fervent ambassador for poker for as long as I can remember,” Greenstein said. In 1993, Johnson purchased Card Player magazine and served as a publisher for eight years. She has also been instrumental in developing the World Poker Industry Conference, the World Poker Players Conference, and the Tournament Directors Association. Now, she serves on the Board of Directors for the Poker Players Alliance and the Ladies International Poker Series. The 2011 Hall of Fame finalists who were nominated but did not receive the necessary votes were Annie Duke, Jennifer Harman-Traniello, John Juanda, Marcel Luske, Jack McClelland, Tom McEvoy, Scotty Nguyen and Huck Seed. All eight finalists are eligible for the Hall of Fame next year. The induction ceremony for Greenstein and Johnson will take place at 1630 PDT on Nov. 8 inside the Penn & Teller Theater. It will be immediately followed by the three-handed finale of the WSOP Main Event final table. Read more about the 2011 Poker Hall of Fame class at WSOP.com. PokerNews Op-Ed: Should There be an Age Requirement for the Poker Hall of Fame?